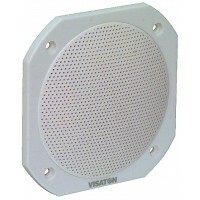 • Saltwater resistant 10 cm (4") full-range driver with glas fibre cone, plastic basket and grille. Balanced frequency response, high efficiency and good high-midrange reproduction. Long time weather proved and therefore especially suited for out-door sound reinforcement systems, swimming pools, sauna and speaker for boats, ships and open vehicles. Also suitable for model boat applications. 120 °C temperature resistant. Zeewaterbestendige 10cm breedband speaker met glasfibermembraam, kunststof chassis en grille. Uit..